Silver ecoPot Kit – Choose your tin or packet! Our gorgeous new ecoPots offer a stylish way to grow and display your magic beans with a beautiful silver metallic finish! Posted to you flat, these pots are made from super strong washable paper and are flexible and reusable. Select any tin or packet below for a gorgeous unique gift. Our tins (inclusive of soil) fit perfectly into the base of the pot, or purchase a packet only option and add your own soil directly into the pot at home! Gold ecoPot Kit – Choose your tin or packet! Our gorgeous new ecoPots offer a stylish way to grow and display your magic beans with a beautiful gold metallic finish! Posted to you flat, these pots are made from super strong washable paper and are flexible and reusable. Select any tin or packet below for a gorgeous unique gift. Our tins (inclusive of soil) fit perfectly into the base of the pot, or purchase a packet only option and add your own soil directly into the pot at home! Rose Gold ecoPot Kit – Choose your tin or packet! Our gorgeous new ecoPots offer a stylish way to grow and display your magic beans with a beautiful rose gold metallic finish! Posted to you flat, these pots are made from super strong washable paper and are flexible and reusable. Select any tin or packet below for a gorgeous unique gift. Our tins (inclusive of soil) fit perfectly into the base of the pot, or purchase a packet only option and add your own soil directly into the pot at home! Bean Me Up Starter Kit – Choose your Tin! Its now even easier to grow your magic beans with our adorable new starter kit! This pack includes a handy mini spade and rake set, water bottle sprinkler (will assist in not overwatering your plants) and all packaged in our reusable calico bag. At only $29.95 it’s the perfect way to begin your magic bean journey! 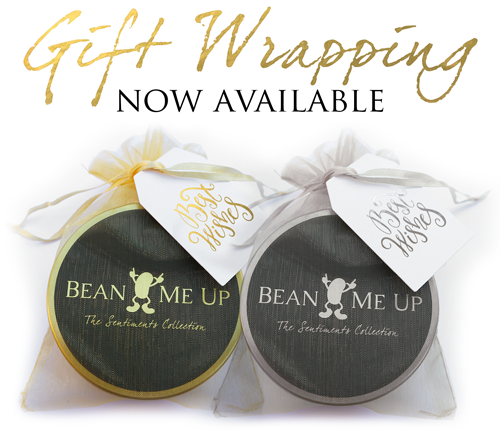 These magic beans are the perfect gift for mum / mom or a special lady in your life – one she is sure to cherish. They will create special memorable moments as you plant and nurture the beans together. Show her she is an inspiration and remind her of the beautiful relationship between a mother and child. Perfect for Mothers’s Day or just to say I love you! Perfect for Father’s Day or just to say I love you! Protective, My Hero, Strong, and DAD, POP, GRANDPA, BROTHER or just I ♡ You!